The wife of Sir Walter Raleigh was a bit of a legend herself. 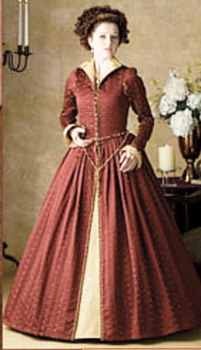 Intelligent, forthright and courageou, Bess was a Lady of the Privy Chamber of Englands Elizabeth I and while at court met Sir Walter Raleigh, 11 years her senior. After a passionate love affair, they married in secret when Bess was found to be pregnant. Her child wsa delivered and she immediately returned to court. The marriage was not discovered until the following year, 1592, whereupon Elizabeth, angered at the couples flaunting of royal decree that no lady in waiting could marry without her permission, had Raleigh arrested and imprisoned in the Tower and Bess dismissed. Bess secured rooms near the Tower, where her son died during the annual disease outbreak. Even after Ralieghs release, the couple refused to beg for pardon, incurring the further displeasure of the monarch. Raliegh later resumed his position at court, embarking on two expeditions to Venezuela in search of cities of gold and establishing the Roanoke colony in Virginia. Raleigh and Bess had two living sons. When Raleigh was beheaded by James I in 1618, Bess had his head embalmed and carried it in a velvet bag to the end of her days. Carew, the son of Bess and Raleigh, had the head returned to the body in St. Margarets church in Beddington, Surrey. #R796 Bodice had long sleeves topped with picadills, turndown collar and button down front. Skirt is full with contrasting underskirt. #R796DX Same as above, but made from velvet, satin, and satin jacquard.